Recently, Danny stuffed his face with something delicious: Brioche French Toast with Mascarpone and fresh fruit from Oddfellows Cafe in Seattle. For one thing, when you have this plate put in front of you, it's pretty impossible not to smile. It's huge. It is the size of your head. Not that quantity is more important than quality, but, you know, a big plate of food is a happy thing. The texture, while crispy on the outside, was almost custardy inside, soft and buoyant, cakey bread which porously absorbed the delicious syrup and strawberry juice that dripped from the ripe, flavorful fruit. The mascarpone added a lovely, lightly tangy flavor contrast which worked beautifully with the syrup and berries, and the bread itself was studded with bits of (orange?) zest which added a nice tart edge and kept it from being sweetness overload. Final verdict: very good. 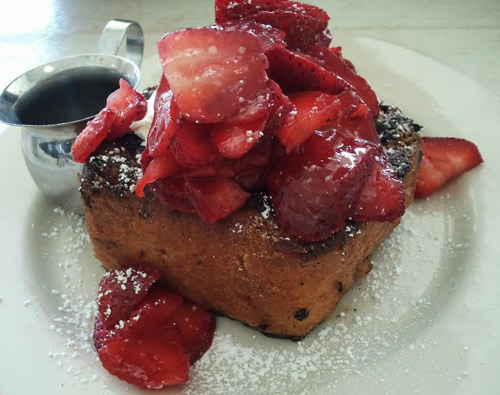 If you find yourself in the neighborhood, you'll probably be going to Oddfellows anyway, as they have so much delicious stuff; if you happen to be there in the morning, the French Toast is going to be a Good Choice. Oddfellows Cafe, 1525 10th Ave E. Seattle; online at oddfellowscafe.com.